For IT News Week 3 Apr 2017. 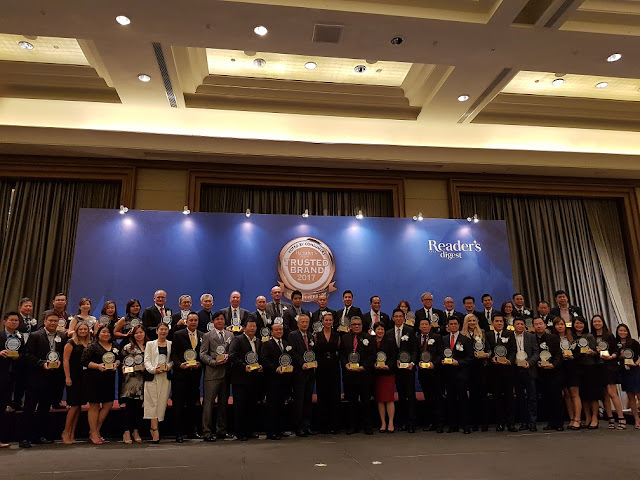 Malaysia’s most trusted brands and household names took centre stage at the 19th Reader’s Digest Trusted Brand Awards, held yesterday at the Mandarin Oriental Hotel. Two local personalities who have won the hearts and minds of Malaysian consumers are: Gina Woon, winner for Most Trusted TV Presenter for her work as news anchor and face of Media Prima Bhd; and the multi-talented Adibah Noor, winner for Most Trusted Entertainer, for a career spanning two decades, that sees her currently hosting Ceria Pagi, the popular week-day breakfast radio show on Suria FM. 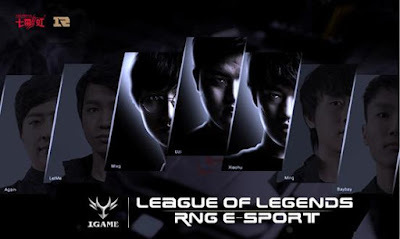 The awards are conducted annually, with winners voted entirely by Malaysian consumers, providing a genuine market endorsement for those topping the polls. Over 2,500 Malaysians – both members of the public and Reader’s Digest subscribers – participated in the study. Winning brands in Malaysia are a mix of local and international names such as Samsung, Public Mutual, Bank Islam, Blackmores, Pos Laju, Knife, Top and Spritzer. From banks to private universities, TVs to household products, the Winners’ List at www.rdasiatrustedbrands.com is a snapshot of Malaysian consumer commitment. While people claim to value their memories more than any other form of data stored on their digital devices, they are happy to sell them for little money, research by Kaspersky Lab shows. A survey has shown that for 49% of people, private and sensitive photos of themselves are the most precious data they have on their devices, followed by photos of their children and spouses. The thought of losing these precious memories is considered more distressing for them than the prospect of a car accident, breaking up with a partner, or a quarrel with a friend or family member. However, when confronted with the decision to delete this data for money, people nevertheless gave their digital data – such as photos – away for as little as 10.37EUR. The participants of the experiment were asked to place a monetary value on the data stored on their smartphones – including photos of family and friends, contact information and personal documents. Surprisingly, the values people placed on their data were significantly lower than expected, considering the distress they said they would experience if they were to lose that data. People tended to put more money against their financial and payment details (an average 13.33EUR) than other forms of data. Contact information was considered to be worth 11.89EUR on average and general photos were valued at only 10.37EUR on average. “The experiment showed us interesting and reflective results: while people believe that they understand the value of their data, the emotional value isn’t reflected in their everyday actions. They know it’s emotionally important, but they are not able to appreciate its value yet. They would need someone to actively remind them of what their data is worth before they share it, or allow someone to delete it.” – said Andrei Mochola, Head of Consumer Business at Kaspersky Lab. 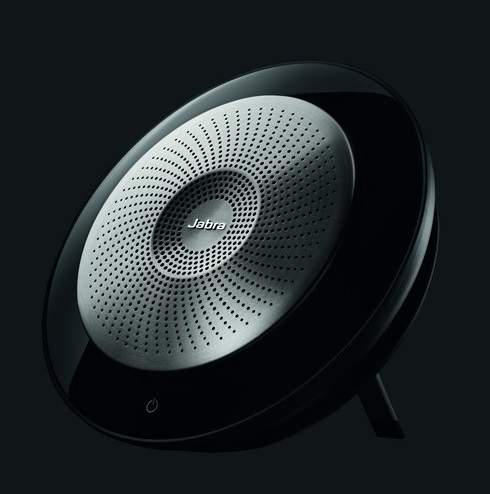 Jabra, the leader in the development of communications and sound solutions, today announced the launch of the Jabra Speak 710. The premium, portable speakerphone, which is designed for professional and personal usage, ensures great sound for conference calls and music. The Jabra Speak 710 is the first truly professional and personal conferencing device for business leaders and C-level executives. It boasts an Omni-directional microphone for up to six ‘in room’ attendees, 15 hours of battery life, superior Unified Communication experience and a HiFi grade speaker for crystal clear conversation and music. The Jabra Speak 710 builds upon the success of the Speak Series, which has sold over 1 million units worldwide. The Jabra Speak 710 delivers an audio performance twice as powerful as Jabra’s market leader Jabra Speak 510. The new family member is designed with an incredible smart feature enabling two units to be wirelessly linked together with the touch of a finger. Pair two devices and create an immersive sound or expand the room coverage from six to twelve attendees. The Jabra Speak 710 retails at RM1,750.00 excluding GST. To purchase, contact Country Manager for Malaysia and Brunei: Gladys Kong at gkong@jabra.com or +6012 2577 305. BTI Consultants, a global leadership consulting firm specialising in board and executive search, talent management, and leadership development announced its regional partnership with Career Partners International (CPI) – the largest global outplacement consultancies providing top talent management services. In this partnership, BTI Consultants has been appointed CPI’s local market expert in several key locations across Asia including Malaysia, Indonesia, India and South Korea. “A partnership with CPI means that BTI Consultants has direct access to more than 1,600 human capital experts in career management, talent development, leadership and executive coaching, career transition and outplacement services,” said Anthony Raja Devadoss, Managing Director and Vice President Asia Pacific, BTI Consultants. 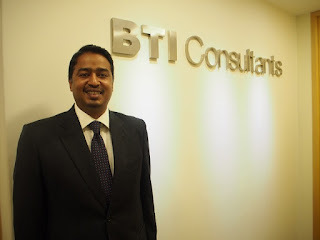 BTI Consultants in Singapore was selected based on its expertise, quality, and reputation for success; coupled with CPI's world-renowned career management programs. This is indeed a key milestone of achievements for both and clients in Singapore now can have direct access to more than 1,600 human capital experts. Cloudera today announced that Bank Mandiri, Indonesia’s largest financial institution, has adopted Cloudera Enterprise to enhance their omni-channel customer engagement enabled by a scalable and robust big data management environment. Bank Mandiri’s wide range of banking services and customer transactions have created an exponential amount of data, leading to challenges across the entire data lifecycle. With Cloudera Enterprise, Bank Mandiri will be better armed to overcome common hurdles in data ingestion, integration and accuracy, creating a seamless big data analytics environment to derive meaningful insights and drive business decisions. With Cloudera’s machine learning models, FSIs can also better predict cybercrime, insider threats, protect customer data and stay compliant with the latest industry regulations. Malaysia-developed Swan Cloud Accounting, a full featured Cloud accounting software, is set to make waves in Malaysia and beyond with its distinction of empowering business owners in managing business finances. Rofarez Solutions Sdn Bhd Founder and Chief Executive Officer Reza Ismail, who developed Swan Cloud Accounting as not the atypical accounting software, is offering the accounting solution free for use for up to 90 transactions a month, making it a boon especially for business owners and small and medium sized enterprises. Knowing too well the growing pains of a small business juggling managing finances and the myriad aspects of business operations having himself started as a small-tech entrepreneur, Reza is making the offer free for life. This is his contribution for fellow business owners to be relieved of the nitty-gritty yet worrisome aspects of keeping the books and staying on top of finances and instead, be focussed and take charge of the business. Reza said upgrades beyond the free 90-transactions-per-month need not be permanent with the availability of 30-day, 90-day or 365-day upgrade packages at special discounted rates. Upon expiry of unlimited transactions packages which come with additional functions like cheque printing and full multi-currency packages, businesses can revert to the free-for-life 90-transactions-per-month. None of their data will ever be lost or removed upon expiry of the unlimited transaction packages. Online sales and website traffic start increasing three weeks before Ramadan; eCommerce sales spiked by 110 percent during the third week of Ramadan. Shoppers spend less time browsing and shopping online during sundown and Eid; retailers can engage them again at night when online browsing and sales increase. Mobile continues to be a key driver for discovery and sales with an increase of 126 percent – surpassing desktops – during Ramadan; half of the shoppers used multiple devices. Criteo delivers personalized performance marketing at an extensive scale. Measuring return on post-click sales, Criteo makes ROI transparent and easy to measure. Mergermarket has released its Global Technology, Media & Telecommunications (TMT) trend report for the first quarter (Q1) of 2017. Take a look at the full report HERE. 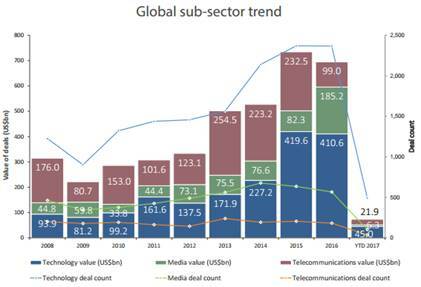 Dealmaking across Technology, Media & Telecommunication (TMT) in Q1 2017 dropped 17.6% in deal value, compared to the same period last year (695 deals, US$ 88.8bn), as 634 deals took place worth US$ 73.2bn. Asia Pacific (excl. Japan) TMT activity was responsible for 39% of global TMT value (120 deals, US$ 28.9bn), almost twice the 20% it captured throughout 2016 (673 deals, US$ 135.8bn). 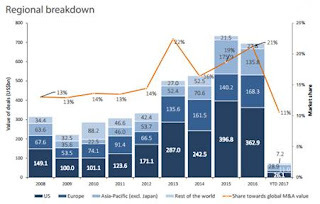 Asia Pacific’s figure was largely influenced by the US$ 12.7bn merger between Vodafone and Idea Cellular, which represented 43.9% of total TMT deal value in Asia Pacific, and 58% of those conducted within the Telecommunications space (38 deals, US$ 21.9bn). The twin issues of Brexit and the unpredictability of the Trump administration are likely to further influence activity, according to Mergermarket intelligence. Both situations are making players more reluctant to pull the trigger on transactions, particularly cross-border deals, later this year as more protectionist policies take hold. 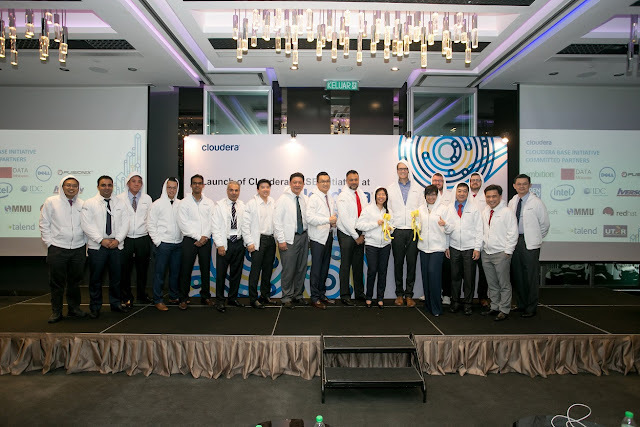 Cloudera, the provider of the leading global platform for machine learning and advanced analytics built on the latest open source technologies, announced that it is collaborating with industry software leaders Red Hat and Microsoft to cultivate a big data talent ecosystem in Malaysia. Focused on developing data scientists to find insights and solve meaningful business problems across industries, the collaboration will see the companies cross-promoting each other's training programs through a collaboration with Iverson Associates, Malaysia’s leading professional IT training provider. Doug Cutting, Chief Architect for Cloudera and Dato’ Yasmin Mahmood, Chief Executive Officer of Malaysia Digital Economy Corporation (MDEC), posing with partners of the BASE launch initiative.